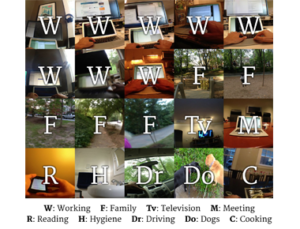 We present a method to analyze images taken from a passive egocentric wearable camera along with the contextual information, such as time and day of a week, to learn and predict everyday activities of an individual. We collected a dataset of 40,103 egocentric images over a 6 month period with 19 activity classes and demonstrate the benefit of state-of-the-art deep learning techniques for learning and predicting daily activities. Classification is conducted using a Convolutional Neural Network (CNN) with a classification method we introduce called a late fusion ensemble. This late fusion ensemble incorporates relevant contextual information and increases our classification accuracy. Our technique achieves an overall accuracy of 83.07% in predicting a person’s activity across the 19 activity classes. We also demonstrate some promising results from two additional users by fine-tuning the classifier with one day of training data. Presented at The 19th International Symposium on Wearable Computers held at Grand Front Osaka in Umeda, Osaka, Japan from Sep. 7-11, 2015. More details at Project Website. Most of the approaches for indoor RGBD semantic labeling focus on using pixels or superpixels to train a classifier. In this paper, we implement a higher level segmentation using a hierarchy of superpixels to obtain a better segmentation for training our classifier. By focusing on meaningful segments that conform more directly to objects, regardless of size, we train a random forest of decision trees as a classifier using simple features such as the 3D size, LAB color histogram, width, height, and shape as specified by a histogram of surface normals. We test our method on the NYU V2 depth dataset, a challenging dataset of cluttered indoor environments. Our experiments using the NYU V2 depth dataset show that our method achieves state of the art results on both a general semantic labeling introduced by the dataset (floor, structure, furniture, and objects) and a more object specific semantic labeling. We show that training a classifier on a segmentation from a hierarchy of super pixels yields better results than training directly on super pixels, patches, or pixels as in previous work. We present an efficient and scalable algorithm for seg- menting 3D RGBD point clouds by combining depth, color, and temporal information using a multistage, hierarchical graph-based approach. Our algorithm processes a moving window over several point clouds to group similar regions over a graph, resulting in an initial over-segmentation. These regions are then merged to yield a dendrogram using agglomerative clustering via a minimum spanning tree algorithm. Bipartite graph matching at a given level of the hierarchical tree yields the final segmentation of the point clouds by maintaining region identities over arbitrarily long periods of time. We show that a multistage segmentation with depth then color yields better results than a linear combination of depth and color. Due to its incremental process- ing, our algorithm can process videos of any length and in a streaming pipeline. The algorithm’s ability to produce robust, efficient segmentation is demonstrated with numerous experimental results on challenging sequences from our own as well as public RGBD data sets.